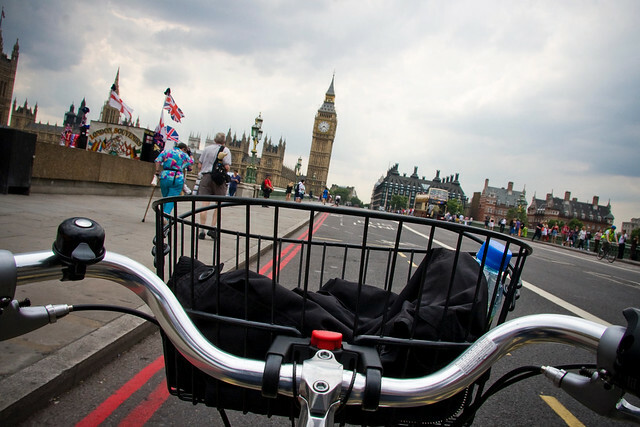 The Carbon Trust's Bicyclegate continued yesterday and made it into the House of Lords. The transcript of which I include here. Generally, reading the questions and responses, it seems like an awful lot of peers with little experience of cycling pulling all manner of stereotypes and misinformation out of their robes. Fortunately, there are voices of rationality present, not least Lord Berkeley, Lord Davies of Oldham, Lord Greaves, Viscount Bridgeman and Earl Attlee. Baroness Butler-Sloss seems not to worry terribly about pedestrians getting hit by cars, instead choosing to exaggerate the myth about "pedestrians leaping to safety out of the path of bicycles". Lord Berkeley posed a question about Carbon Trust's ban on bicycles and Earl Atlee responded with, "My Lords, the noble Lord will be fully aware that this Government are concerned about the overapplication of health and safety regulations." The whole question session wraps up with a bit of humour and teasing, which is always nice to see. Although if Baroness Trumpington were to come to Copenhagen, I'll take her on a lovely pushbike tour of the City. To ask Her Majesty's Government what steps they are taking to ensure that cyclists abide by the Highway Code. Earl Attlee: My Lords, the Government support a combination of information, education, training and enforcement to ensure that cyclists abide by the Highway Code. The enforcement of cycling offences is a matter for individual chief officers of police. The hazards caused by cyclists who break road traffic laws are recognised by chief officers and action is taken where offences are detected. The Government support action taken by the police to deter and reduce the number of cycling offences. Lord Palmer: My Lords, I thank the noble Earl for that slightly unexciting reply, but does he not agree that it is a scandal how remarkably few prosecutions are made against cyclists who do not adhere to the Highway Code-most especially driving on pavements? Earl Attlee: My Lords, I entirely agree with the noble Lord. I know that all noble Lords are extremely concerned about that type of offending. It adversely affects noble Lords, because they tend to be a little bit older than the average member of the population. Baroness Sharples: Can my noble friend tell us how many successful prosecutions there have been against cyclists who have gone against red lights? Earl Attlee: My Lords, the short answer is no. The reason is that most offences are dealt with by fixed penalties-the penalty is about £30-but detailed records are not kept because that would not be a good use of public funds. Lord Haskel: Does the Minister accept that most cyclists abide by the Highway Code purely out of a sense of self-preservation from the motorists who do not? Earl Attlee: My Lords, it is most important that every one reads the Highway Code from time to time, in order that they understand their obligations as road users. Lord Davies of Oldham: My Lords, I ride a bike - in fact, I was riding one this morning - so I declare that interest, but, in balance, I also drive a car. Let us get the issue of bike problems into some kind of perspective. What percentage of the road accidents in which our fellow citizens died last year were due to lawbreaking by cyclists, and why are the Government abolishing Cycling England, which seeks to train cyclists? Earl Attlee: My Lords, we will have to wait for the comprehensive spending review later next week to answer that question. Lord Greaves: My Lords, I speak as a motorist and a cyclist who seeks perfection in both areas and fails miserably a lot of the time. Does the Minister agree that there is a real difference between traffic offences committed by cyclists or anyone else and breaches of the Highway Code? Simply breaching the Highway Code may be impolite, foolish or dangerous, but it does not necessarily amount to an offence. Does he agree that cyclists are far more vulnerable than drivers of cars, lorries, et cetera? Earl Attlee: I agree with my noble friend and, returning to the point made by the noble Lord, Lord Davies of Oldham, the reason why the police concentrate more on motorists is because they cause more serious accidents than cyclists. Lord Berkeley: My Lords, the Minister said that the Government are keen to educate people about cycling. Could he start with one of his own quangos, the Carbon Trust, which has just put out a circular to its members saying that they must not cycle to or from work or between meetings, especially on Boris bikes, because it has not been able to do a risk assessment on the quality and safety of Boris bikes? Earl Attlee: My Lords, the noble Lord will be fully aware that this Government are concerned about the overapplication of health and safety regulations. Baroness Finlay of Llandaff: Does the Minister have any information on how many accidents occur at dusk and at night to cyclists who have no lights or high-visibility jackets? Earl Attlee: My Lords, it is a legal requirement to have a rear light, a rear reflector and a front light. It is not a legal requirement to carry reflective clothing, but the Highway Code recommends that proper clothes-reflective clothes at night and fluorescent clothes during the day-are worn at all times when riding a bike. Viscount Bridgeman: Will the Minister be assured that the All-Party Group on Cycling, of which I have the honour to be a member, sets an example for all to follow? Earl Attlee: I am very grateful to hear that. Lord Kennedy of Southwark: My Lords, will the Minister speak urgently to the Mayor of London? A consequence of his cycle hire scheme is a dramatic increase in the number of cyclists on the roads in London not in the correct attire, with no helmets or reflective clothing. Such circumstances dramatically increase the risk of serious injury or even death. Earl Attlee: My Lords, it is very easy to overestimate the risk of accidents when riding a bicycle. The health benefits of riding a bicycle are very great indeed. For every year of life we lose to a cycling accident, we gain 20 years of life. Therefore, the bike hire scheme has great health benefits. Baroness Butler-Sloss: My Lords, may I put in a plea for the pedestrian? A lot has been said about cyclists, but is the Minister aware that the group most vulnerable to cyclists is pedestrians? The reason why there are not so many accidents is that pedestrians have to jump out of the way on pedestrian crossings and when the lights are green for pedestrians on red lights. It is a scandal. Earl Attlee: My Lords, I fully understand where the noble and learned Baroness is coming from, but in 2009 no pedestrians were killed, 66 were seriously injured and 14,000 suffered slight injuries on our roads. This is a 21 per cent reduction on all pedestrian casualties hit by cyclists compared to the 1994-98 average. Lord Brookman: Following on from the previous question, I recall that this House, in which there are a lot of new faces, had a solution: the noble Baronesses, Lady Sharples and Lady Trumpington. Give them the legislation, and they will sort the problem. Earl Attlee: My Lords, I think it is a little bit late for the noble Baroness, Lady Trumpington, to start riding a pushbike.